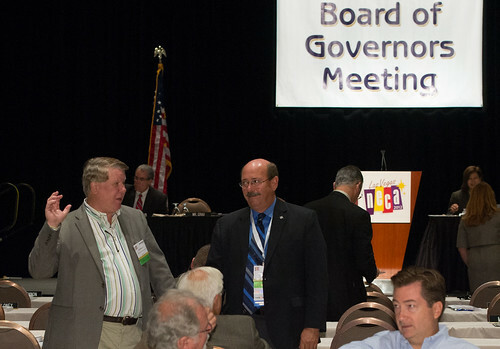 The NECA Board of Governors met on Saturday, September 27, at the McCormick Place West, Chicago, Illinois. During the meeting the board approved the 2013 meeting minutes and several items of association business including committee and officer reports, standing policies, ordinary proposals and bylaws amendments were reviewed. NECA Secretary-Treasurer Traci Pickus reported that there are currently 119 US chapters and 14 international chapters, 4 new international chapters were added in 2014 including: British Columbia, Ontario, Ecuador and Greater Toronto. NECA has also approved several new student chapters in 2014, including: Wentworth College, Stark State College, University of Toronto, Dunwoody College of Technology and Illinois State University, bringing NECA to 33 total student chapters. NECA CEO John M. Grau updated the board on his top priorities including the current skilled worker shortage, calling it a “Recession Hangover,” resulting in a lack of trained apprentices. He also believes this is due to the recent industry growth of the Oil and Gas industry. Grau also notes that keeping up with technology in the field is becoming an issue, stating that gadgets are no longer gimmicks and have become a staple in the workplace. It’s a growing trend in the field as well and how we deal with this going forward is going to be important. NECA COO Dan Walter reported on NECA’s services, including an array of new mobile apps like the NECA Safety Meeting App, News App, Advocacy App, PPE Selector App, ELECTRICAL CONTRACTOR magazine monthly issue app and more. During the meeting new academy inductees were honored, along with past presidents, premier partners, and the recently deceased Tom Glavinich. Outgoing President, Dennis Quebe gave his last report to the Board of Governors and President-Elect, David Hardt shared plans for his upcoming term in office and presented Quebe with an honorary membership at NECA, handing him a silver gavel in honor of his dedication and service to the association these past 4 years. There were no votes this year. Complete information about the Board of Governors agenda and roster can be found on NECA’s website, necanet.org/BOG. 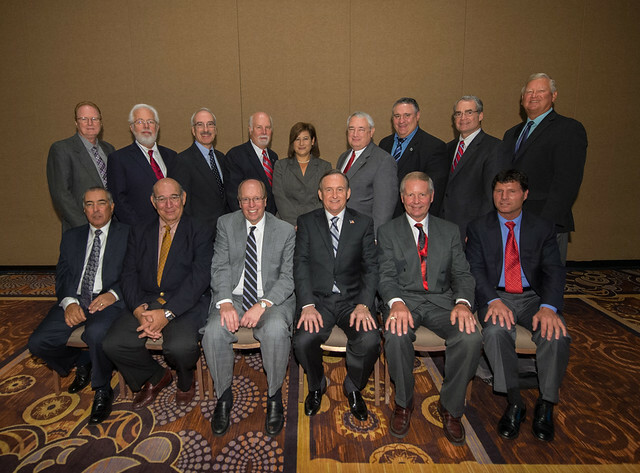 The NECA Board of Governors held its annual meeting Saturday, Oct. 12 at the Grand Hyatt in Washington, D.C. The Governors reviewed several items of association business, including committee and officer reports, standing policies, ordinary proposals and bylaws amendments. Voting results were all bylaws amendments and ordinary proposals were approved. Complete information about the items voted on by the Board of Governors can be found on NECA’s website. Bylaw Amendment #1: Proposed to amend Sections 10.2, 10.3, 10.4, 10.5, 10.6 and 10.7 regarding Terms of Office. 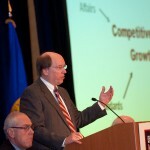 NECA President Dennis Quebe opened the 2012 NECA Board of Governors meeting today to tend to the association’s annual business and governance. The Governors heard officer reports from NECA Secretary-Treasurer Traci Pickus, CEO John M. Grau, COO & Vice President Dan Walter, and Vice President, Labor Relations Geary Higgins. IBEW International President Edwin Hill also spoke to the group about CW/CE and the Code of Excellence. The Governors passed Ordinary Proposal #1, submitted by NECA’s District IV Council, to amend NEBF’s Definition of Gross Labor Payroll, by voice vote. The proposal means that NECA will work with the IBEW to replace the wording of “Gross Labor Payroll” with the words “Productive Electrical Labor Payroll” in the NEBF standard Category 1 labor agreement language and will direct the NEBF Trustees and National Employees Benefit Board to replace the wording of “Gross Labor Payroll” wherever it appears in any NEBF plan and trust documents with the words “Productive Electrical Labor Payroll” and specifically reword Sections 6.1 and 6.2 of the NEBF Restated Employees Benefit Agreement and Trust. The actual amendment of the NEBF Agreement requires concurrence by the IBEW. The full text of the online proposal can be viewed online. The Governors also reviewed nominations for five Vice President candidates, and all candidates passed with unanimous approval. The candidates will take office on Jan. 1, 2013 and serve two-year terms. Michels Power Division of Michels Corp.
Members of NECA’s Executive Committee and Board of Governors convened Oct. 2 to review two proposed bylaw amendments, one ordinary proposal and reports from the organization’s staff officers, committees, and task forces. 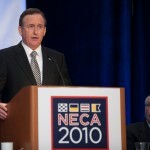 NECA President Rex Ferry chaired the meeting. Neither the amendment to increase NECA member dues or the amendment to NECA’s bylaw regarding the Council for Industrial Relations (CIR) passed by the required majority. 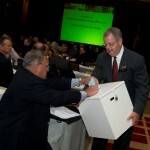 An ordinary proposal to update NECA’s standing policy on government affairs was approved by voice vote. The Board of Governors voted unanimously to approve the nominations of district vice presidents Greg Stewart (District 2), George Adams (District 6) and Gary Tucci (District 10). David Hardt (District 4) and Ray Friend (District 8 ) were elected to their second two-year term. The officers will begin their two-year terms on January 1, 2011. Current District 2 Vice President Dennis Quebe was unanimously voted as NECA President-elect, a one-year term that will begin January 1, 2011. 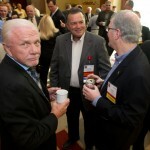 Quebe will then serve a three-year term as NECA President, beginning in 2012. The Board of Governors also recognized Milwaukee Electric Tool as NECA’s 2010 Industry Partner award winner. NECA’s Board of Governors meeting today included passing a new standing policy on safety programs and safe workers and election of five new district Vice Presidents. The new VPs will start their two-year terms on Jan. 1, 2010. District 1 Vice President David MacKay was elected to a second term. Take a minute to meet NECA’s newest VPs. Jennifer Brice, ElectricTV.net host, reports on NECA President Milner Irvin’s last Board of Governors meeting at the 2008 Chicago Convention, green industry trends, and the gala opening reception Party at the Pier.